At Thomas Foods USA, we source the finest lamb, veal and beef from Australia, New Zealand, Europe, Brazil and the USA. Never let it be said we won’t go to any lengths to find the best, most delicious meat in the world. And if you’re going to travel as far as we do to find the best quality, you want to make sure that quality is maintained all the way through to the customer. Because that’s really the whole point. To that end, our fully integrated supply chain means we can guarantee our fresh, natural meats are always high quality and delicious. And our processing and cold storage facility located near Philadelphia gives us the flexibility to adjust to changing customer needs and consistently deliver on our promise of excellence. So you can be sure that, on the road from our farms to your tables, nothing will fall between the proverbial cracks. Our sales team is 100% customer focused. We don’t just want to sell you meat products; we want to meet all of your demands and help you serve the finest products to your guests’ table. We’re eager to help navigate our broad portfolio of protein options or work with you to fully customize a program that will be the best solution for your business and will surely wow your guests. Our extensive integrated supply chain allows us to better serve you and ensures a consistent, delicious and safe product every time. Thomas Foods USA sources the finest meats from around the world so that you don’t have to. We have an extensive portfolio of options to meet all your needs. Contact our sales representatives now for more information. Our grass fed and grass finished cattle are raised on open green pastures where they freely roam and graze on a grass fed diet for their whole lives. Never confined to a feedlot, our grass fed beef is all natural, with no artificial ingredients, minimally processed and halal certified. Our cattle are raised on open green pastures where they freely roam and graze on a grass fed diet for their whole lives. Our cattle are never administered added growth hormones and antibiotics. Our organic beef is all natural, with no artificial ingredients, minimally processed and Halal certified. A pure product of its pure environment, our exclusively Australian grass fed beef program is one-of-a-kind. Our humanely raised black angus cattle are raised on open Australian grass pastures, never confined to a feedlot and never administered growth hormones or antibiotics. Graded for eating quality as well, you can be assured not only will you feel good about purchasing our Angus Pure beef, you will also enjoy eating it as well…..every time. The majority of our Wagyu beef comes from Stanbroke, where they are wholly focused on supplying the finest quality beef to their customers. Diamantina, Australia’s premium Wagyu beef comes from the Diamantina Shire in western Queensland, and is famous for producing some of Australia’s finest cattle. Stanbroke selects the best breeds, and ensures they feed on a grain rich diet – which produces decadently marbled beef and a uniquely superior taste experience. Raised on Certified Angus Beef farms these cattle spend the majority of their lives on pasture grazing on grass and forage then grain finished for 4-6 months. Their grain diet consists of corn, wheat and milo, as well as high energy grains important to support cattle growth and to produce high quality beef. 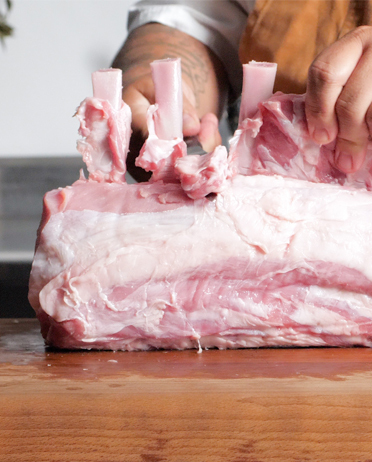 Our organic lamb is humanely raised on Australian ranches and family farms certified USDA organic. Raised without the use of antibiotics and added hormones, our organic lambs roam free on native pastures that have not been sprayed with artificial chemicals. As a leading supplier of Australian goat meat, our quality goat meat products are available year round either foodservice packed or retail frozen case ready. Our goats roam free on native rangelands and pastures and are certified halal. Our Royal Dutch Veal from the Netherlands is a premium milk fed veal program with a tradition that goes back 100 years. Our calves are humanely raised in groups of 5 to 6 and have never tethered or shackled. Fed a wholesome milk diet, our calves have also never been administered growth hormones and our unique production system guarantees individual lifetime traceability from farm to each meat package. For more information, please visit www.royaldutchveal.com/. We’re natural-born innovators. Tinkerers. Whether it’s farming practices or supply chain updates, we can’t leave well enough alone. Because well enough isn’t good enough for us. Or for you. That’s why we don’t hand off any part of our process to anyone else. We do everything from product to innovation to packaging to make sure we’re delivering the best at every stage. Every point in the process of delivering the best meats in the world to you and your customers is an opportunity to go that extra mile. The best doesn’t come easy, which is fine with us.